Reviewing Authority's Recommendations: Accused struck or slapped PWs for violations of camp regulations (selling underclothing, argument with foreman at worksite, calling the Japanese civilians "Japs"). The subordinates of the accused beat and abused prisoners on various occasions for no reason or for minor violations of camp regulations. Reviewing Authority: Accused ordered guards not to beat the prisoners. Accused was never seen slapping a PW. Accused was a good commander: visited sick prisoners; played baseball with prisoners; maintained a book for complaints for the prisoners upon which he acted; interfered with the manner in which the factory officials handled prisoners including withdrawing complete work details from the factory from time to time to correct some evil, despite having no authority; refusing to send prisoners to work without rice raincoats; allowed prisoners to leave camp with guards to purchase supplies. Accused was removed by the Commandant of the Tokyo Main POW Camp from Camps 3D and 10D because the accused's friction with those guards/civilians at the shipyards. Accused did as much for the prisoners as he could, even at the risk of his own reputation. During the time when the first 3 specifications happened, his subordinates and company employees were thinking more and more ill of him because of the increasing raids; he feared that if he were too easy in his treatment of these prisoners, during his absence, the prisoners would be treated more harshly; that is why he took such steps. After these acts against the prisoner, they did not break the rules; the company employees and his subordinates held no further ill will towards him. He believes it had a psychologial effect on the prisoners, company employees and his subordinates. The work that the prisoners did was through a contract between the company and the War Ministry: he had no control over it. 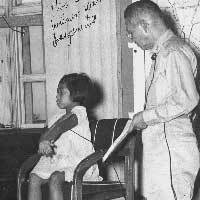 The acts that he did recall, mentioned in the specifications, were usually dealth with by forcing the Japanese guard to apologize and by cutting the pay of the guard: these incidents were usually reported to him by the POW officer in charge. He did not recall many of the other incidents. Prosecution Arguments: The commission in open court stated that the sentence adjudged was meant to be a "token" sentence and that, because of the time the accused had spent in prison prior to the time of setnence, it be recommended that the sentence be suspended subject ot accused's good behavior. The reviewer stated that "it appears, from the record and other sources, that accused, although technically guilty of certain offenses, in many other ways went far beyond his duty in order to make the conditions of the POWs as good as possible under the circumstances, so far beyond, in fact, that he was relieved of command because of his humane treatment of prisoners. This treatment was of such a nature that he was considered disloyal to his own country at the time of her greatest crisis." So, the reviewer recommended that the sentence of the accused be suspended.